After more than a year without any Game Of Thrones, the final season is very much a double-edged sword. Sure, the debut of the first episode of the season means we've got something new to obsess over, but this is the beginning of the end and boy were the show-makers keen to make sure we knew it. The season premiere was full of ominous portents of doom as well as delightful reunions designed to make us all feel good before they kill everyone and rip our broken hearts out through our faces. God, it's great to have this show back, isn't it? So what happened in the first episode of season 8 (whose title remained under-wraps until it aired) and what can we learn for what might come next? 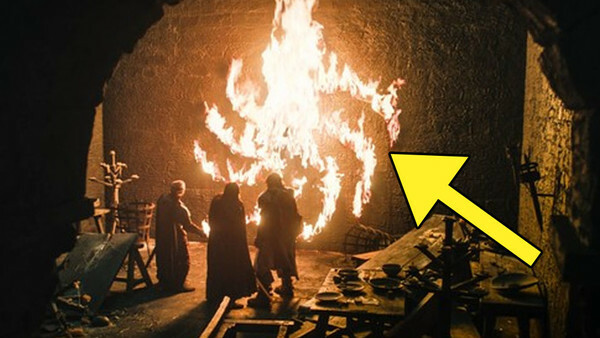 Here's what everything we saw in 'Winterfell' means. There's a lot to unpack here and if you need to be told there are spoilers within, then take this as fair warning. If you're looking for the Cliff's Notes on what Bran does throughout the opening episode, it's basically just a series of creepy looks at people while he says equally creepy things like he's "almost" a man. But at least the creep has a purpose early on. It's through his three eyes that the Winterfell alliance learn about the fall of The Wall and - more importantly - of Viserion's turn to the dark side. They can at least now attempt - in vain, probably - to come up with some sort of plan for dealing with the ice dragon. Incidentally, you'd have thought that both of those revelations might have brought bigger reactions from Dany and Jon, but maybe they're just numb to it all now.